There is ample justification of thinking the 1920's was the Golden Era of motorcycling. Those big classic events - the London to Edinburgh Trial, the London to Exeter and the London to Land's End - to name but a few, were attracting fantastic entries. In the first-named no less than 203 motorcycles, sidecars and three-wheelers took part in this super long-distance Whitsuntide classic in 1921. But Gus Kuhn's name was not there and neither was it in the London to Land's End in which 148 motorcyclists started and only 108 finished. "London to Land's End" was certainly a magic phrase, and one which made an appeal to the motorcyclist as alluring as the Spanish Main was to our forefathers. That was one reason why the Motorcycling club's annual Easter run to the south-western extremity of our island attracted such a large entry. Over the years the conditions had been made more and more severe in order to keep pace with the increased speed, power and reliability of up-to-date motorcycles, and this year a competitor had a very difficult task to earn one of the coveted Gold Medals. First organised as long ago as 1908, this particular event had been run annually, except, of course, in the war years. But this year the inclusion of a time limit on the dreaded Porlock Hill was instigated; it had to be climbed at an average speed of 18mph. Further, after this three miles timed section, competitors were required to average 20mph, until the notorious Lynton Hill had been scaled. And then on towards Bideford, Launceston, etc., eventually to Land's End to complete the 314 miles total. However in the 216 strong entry, Frank Longman riding a 3½ Ariel proved the outright winner and gained the premier Award - the Jarrett Trophy. Frank, of course, will be remembered as the head of the Greenford Motorcycle Racing Club which organised its first Cinder-track meeting on Easter Saturday 1928. And the Greenford Speedway had two parallel straights about 220 yards long, joined by bends measuring exactly a half-mile to the lap. It became one of Britain 's finest circuits. But back to Gus Kuhn - the fellow who had a passion to excel - who was still enjoying his merry-go-round of reliability trials, etc. His versatility was not only high-lighted in motorcycle sport events but in machines too for instead of the Levis he was now riding a 2¼ Verus, just one of the makes out of the total of 127 different makes of machines that were being manufactured by British manufacturers! Hardly believable today, but nevertheless a fact. On the Verus - a model which could be purchased brand new for £60 - Gus competed in the big opening trial of the year (1921), the Colmore Trophy Trial, the classic Midland event, organised by the Sutton Coldfield and North Birmingham Clubs. And, gaining full marks, he was awarded a Silver Medal. But Gus, like all the rest, found the course extremely severe. Despite its severity though, British motorcycles again proved how reliable they were; very efficient hill-climbers too and easy-to-ride mounts, for any motorcycle that was not well-balanced could not be handled in ruts and stones and on greasy lanes in a manner to give its rider a "non-stop" run. The fact that retirements represented 9 per cent of the starters showed clearly that motorcycles had passed that stage when trials were necessary to develop them into machines capable of surmounting hills and running to time. Once again, Gus won another Gold Medal riding the same machine in the following Victory Trophy Trial in which there were 144 finishers in the over-170 starters. Run in the Cotswold District such hills as The Beacon, Old Wyche, Portway, Birdlip, Rising Sun, Sudeley and Willersey were included in the 128 mile course. It was doubtful whether such high speeds had ever been seen on Rising Sun; one after another, competitors came up out of the bottom of the valley on to the top of Cleeve Cloud. And Gus Kuhn (Verus) was reported as making a very fast ascent. There was every indication that the summer would be quite eventful from the speedman's point of view. More than ever, motorcycle manufacturers were realising the value - both from a publicity and an educative angle - of successes in trials, races or in record-breaking. The large entries for the spring speed trials augured well for the most important events a little later on, and, the thoughtful designer was appreciative of the assistance accruing from such events in producing his machines for the Tourist Trophy and Grand Prix races. Although Gus gave the TT a miss for once, [Actually, Gus did go to the IoM with the BSA team, but it was ill-fated] it is interesting to note that Freddie Dixon who, seven years hence, would be in charge of the Dirt Track department at the Douglas works in Bristol, as head tuner of the firm's Speedway models, secured second place in the Senior TT on a 3½ hp Indian, his average speed being 54.02 mph. And he made the fastest first lap. His prize was £25! At the start, Freddie was unquestionably the great favourite, and lived up to expectations by leading the 24-strong field at the end of lap one, but his Indian, capable of 85 mph, faltered and, glancing down he saw the inlet spring was broken. Carrying on, his maximum speed decreased by 5 mph or more and in these circumstances it was indeed a meritorious ride. As I have said, Gus gained a Gold Medal in the Victory Trophy Trial. He was still riding in the same event 30 years later! And this time he was riding a Royal Enfield and long since a grandfather! Early in April some startling performances were made at Brooklands and Rex Judd on a standard Model 16H Norton, in spite of the rain and a cold south-westerly wind, covered the flying kilometre at 92.44 mph, which constituted, in the 3½ hp class, a British and International World record. And it was Rex who later in 1928 linked up with Freddie Dixon in the Douglas Speedway tuning department. Incidentally, it was in May of this year (1921) that, for the first time on record in this country, a speed of 100 mph was attained. The honour fell to D H Davidson and his mount was a Harley-Davidson twin achieving the record on the Brooklands course. It had been a great battle for the first rider to reach the magic "100" because Bert Le Vack was out to gain the honour too. Bert, in his attempt rode an 8-valve Indian machine manufactured by Hendee Co. in America and, associated with the firm was W H (Billy) Wells, who was in charge of Bert's machine. However Bert was only able to achieve 98.98 mph - so near and yet so far. My mention of Billy Wells brings to mind Stamford Bridge Speedway for he was the Secretary of the Meetings and Clerk of the Course for several years from 1928. Later in the year, in July, Herbert Le Vack on the Indian won the great 500 mile race at Brooklands averaging a fantastic 70.42 mph, an amazing performance. Freddie Dixon on a Harley came second. And for his magnificent exploit Bert was awarded the Miller Gold cup. When speedway began in Britain we saw quite a few of the phenomenal Harleys in action and how tremendously successful they were. The Indian was, of course, American manufactured like the Harley, but we only saw just a single one on the "Dirt" and this was ridden by the renowned Art Pechar. Although not a competitor, Gus Kuhn was interested in the great races at Brooklands, over a 2.7 mile banked concrete course at Weybridge in Surrey, but in competition I suppose his happiest moments were in reliability trials, and particularly the Colmore. The Colmore was perhaps King of the Classics in the early 1920's, when trailers were unknown and cars that could tow them were owned only by the top executives. When riders used their trials mounts to get them from all parts of the country to the start and when the start was at 8 or 9 am, and the finish at dusk or even after! And so, after covering the usual 130 mile course, another great day would come to its inevitable end, and a bath and a mighty feast would place a seal on it and set everyone right for the great tomorrow. But the famous hills would never be forgotten: hills like Mill Lane, Sudeley, Kineton, Laverton, Stanway, Bushcombe, Rising Sun and a host of others. In the days of which I am relating, the trial did not end with the usual signing off at the finish. There were great open fires to be enjoyed, great stories to be told in front of them; enormous dishes of ham and eggs to be devoured, tales of past victories; perhaps plans for future conquests, not forgetting a game of darts with the locals. Then came the final drink and after, into the riding gear once again, all aglow for the homeward journey. Happy days indeed for Gus and his "merry men". A record entry was received for the 1922 Colmore Trial with 125 solos, 66 sidecars and 17 cycle cars, a total of 208. And, once again, Gus Kuhn was riding a different make of machine - this time a 4hp Douglas: he certainly had variety in the trials game. In this event however, the winning of a Silver Medal was an honour approximating to the Gold Medal in a normal trial. And the Douglas - the biggest machine that Gus had competitively ridden - gained for him a Silver. Shortly after, came the famous London to Land's End Trial in which a phenomenal 322 competitors took part and, yet again, Gus Kuhn rode another make of machine - a 2½ Calthorpe registration number OK 464. But I have established that this was not the Calthorpe on which Gus started Speedway Racing in early 1928, for this one's number was OK 5161. In Gus Kuhn's early trials days Eric Spencer was not only a great exponent of the sport but also Gus's friend. 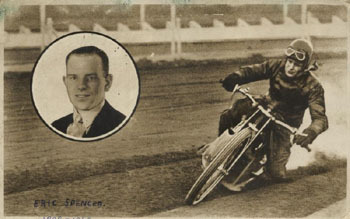 Here he is later in 1929, speedway racing. This year the Trial had been made more difficult by the inclusion of Beggar's Roost (Barbrook Mill), one of the most arduous climbs in the country, with the steepest section of 1 in 3 and, for the whole ¾-mile length of the hill the gradient averaged 1 in 7. Gales and gradient proved uncommonly difficult obstacles in this particular trial - the record-breaking Eastertide event of the M.C.C. for the President's and Captain's Trophies. Several competitors were destined to be associated with Speedway: and these were not without success for Gus won a Silver Medal; Eric Spencer (494cc Douglas) won a Gold and Eric became a Dirt Track ace in 1929: Frank Longman (498 Ariel) the Greenford Speedway promoter, already mentioned, also won a Gold: Lionel Wills (499 Rudge), one who was instrumental in bringing Speedway to this country won a Gold and Stan Glanfield (260 Cotton-Villiers sidecar) Speedway promoter-to-be, won a silver. The Captains Trophy presented by Billy Wells (later of Stamford Bridge Speedway) was won by J J Ellis (993 Matchless sidecar) while the Presidents Trophy was gained by A.G.Wells (398 Ariel). Billy Wells himself riding an ABC also won a Gold Medal.